Some masonic references cannot be catalogued. They remain unique. Philip V. Allingham Photo, 2006. 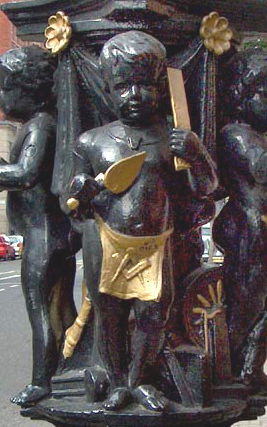 This decorated lamppost, with cherub, masonic apron, trowel, and ruler, dates from 1862 when Ulster Hall in Belfast was designed by William J. Barre (1830-1867). William J. Barre's greatest rival in Belfast architectural competitions was Sir Charles Lanyon, one time Grand Master of the Grand Lodge of Ireland. 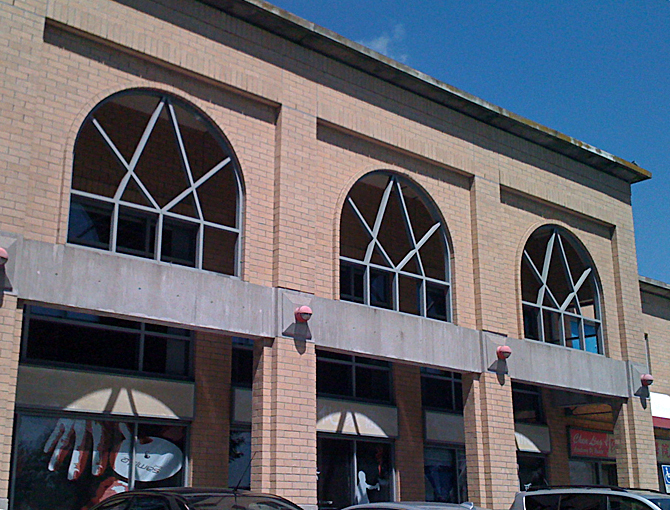 The mullions of this shopping centre entrance clearly depict the masonic square and compasses. João Baroni offers lodging to freemasons and their families while undergoing treatment at the local cancer hospital. A satelite view can be seen at coördinates 20 34 45.51 S, 48 34 34.14 W and further details are available at paragemdeourofino.com.br. Opened in 1932, the International Peace Garden is a 2,300 acre botanical park straddling the U.S. and Canadian border between North Dakota and Manitoba. The Masonic Auditorium was built in 1981, and sponsored by the Grand Lodge of North Dakota and the Grand Lodge of Manitoba. This flagstone square and compasses on the grounds of the Tower of London is situated on a private walkway between Tower Green and the residences, near the entrance to Beauchamp Tower. The date of its installation is unknown. This horse brand was photographed in Seville, Spain and printed in the Winter 2003 issue of Freemasonry Today. Square and compasses cookie cutter offered for sale on an internet auction in 2003. The same contraption, now termed an ice cream mold. Apparently there were six different shapes of these made, the others including a playing card spade and a policeman's star and crescent. Freemasons Hotel appears to be a common name for hotels, at least in Australia. In Britain there are almost three dozen drinking establishments named Masons Arms, Freemason's Arms, or some variant. Near Norfolk International Airport, Virginia, can be found Freemason Street and Freemason Mews. Freemason Island, a subaerial island with a substrate composed of mollusk shell fragments, is the southernmost of the Chandeleur chain of islands off the shore of St. Bernard County, Louisiana, USA (Lat: 29.79083, long: -88.97417). It was a nesting spot for Reddish Egrets and Louisiana Herons until several freezes starting in 1962 killed off the Black Mangrove thickets. Hurricane Ivan swept the area with a maximum sustained winds of 212 kmph (132 mph) on September 16, 2004, reducing the island to two small islets. Owned by the Grand Lodge of North Dakota, Masonic Island on Lake Metigoshe, North Dakota, has been the site of summertime masonic meetings since 1905. Masonic features of the island include a set of three, five and seven steps leading up from the dock, mortered stone chairs and altar, and a large carved square and compasses. The Polyteknisk Flyvegruppe is a Danish Flying Club. Their logo appears to be inspired by the square and compasses. The International Association of Machinists logo contained a square and callipers. When they re-formed with the aerospace workers they modified the original logo. Founded in 1853, the Junior Order of United American Mechanics was an outgrowth of the Union of Workers, founded in Germantown, Philadelphia in 1845 by a group of working men attempting to stop immigration. Alvin J. Schmidt reported in Fraternal Organizations (Greenwood Press, 1980) that by 1979 the membership was 8,500 social members and about half as many insurance members. In 2010, Lexington Council No. 21 continued to support the American Children's home in Lexington, NC which they built in 1927. Other than the logo, there appears to be no historic association with Freemasonry. While the all-seeing eye of Providence, checkerboard flooring and the clasped handsseen here on the Fraternal Order of Police emblemare not exclusively masonic, the three towers formed part of the arms granted to the London Company of Masons in 1472. The use of such terminology as Grand Lodge and Brethren further suggest a masonic connection. The city of Apopka, Florida was incorporated in 1882, with the city limits measuring one mile in all directions from the masonic lodge hall for Orange Lodge No. 36, located at what is now Main St. (US 441) and Alabama Avenue. The current city logo, designed in 1976, commemorates this masonic heritage by incorporating the masonic square and compasses into its design. The image is no coincidence, George William Miatt was an active Royal Arch freemason with Manhatten Chapter No. 184, R.A.M., and Shriner. Square and compasses emblem embossed on a bottle of cooking oil supplied by 4 Oak Oil & Vinegar in Prince George, BC. An industrial and commercial design firm in Kelowna, BC has taken the tools of their trade and arranged them in a fashion reminiscent of the masonic emblem. Whether this was intentional, or just good design, is unknown. Established in 1997, the Island School of Building Arts has adopted two logos, one seen here, that bear a striking resemblance to the masonic square and compasses emblem. Neither the owner nor the school are known to have any masonic affiliation. Weed Pleez, and other medical marijuana dispensers in Canada, promote a British Columbia vendor with the brand name, Compass Exclusives. The illustration is a copy of an image found on Pinterest with the addition of a marijuana leaf and text. In the video "Its Tricky" by the rap group Run-D.M.C., a woman playing a card game with Penn and Teller is wearing a black 32° Scottish Rite hat. Further examples of masonic references in music can be found at freemasonry.bcy.ca/fiction/music.html. The big news that year was that Mason made it into the top five. In the last ten years, Mason has catapulted from 64th place to second. Its popularity might be because Kourtney Kardashian named her son Mason in 2009. Mason is an interesting name because it is also an occupation. Traditionally, a mason is someone who is skilled with stone. Other occupations have also transitions into names, like Archer, Dean, Hunter, and Taylor. However, they have never been the most popular names in America. An Apple computers 'fanboy', Joel Hladecek, posted his Confessions of an Apple Freemason on July 22, 2010, wherein he defined an 'Apple Freemason' as one who had supported Apple since its earliest days in the 1980s. Why is unclear. In Gemini Crosswords' Cryptic Crossword for Monday, April 13 (12985), the clue for 7 Down reads "Priceless stonework found in lodges (11)". The answer is Freemasonry. Cryptic Crossword © Gemini Crosswords All Rights Reserved. At least two ships have had masonic names. Two sailing ships of interest operated off the U.S. Eastern seaboard between 1737 and 1779. They were the "Freemason" and the "Master Mason". The brigantine "Freemason" is recorded on voyage in late 1772 while in Shipwrecks North of Boston: Vol. 1: Salem Bay a note is made of a "... storm, killing ten (1773); The explosion at anchor in Marblehead of the privateer brigantine Freemason" in 1779. A brigantine is a vessel with two masts, at least one of which is square rigged. In modern parlance, a brigantine is a principally fore-and-aft rig with a square rigged foremast, as opposed to a brig which is square rigged on both masts. In the late 17th century, the Royal Navy used the term brigantine (often contracted to brig) to refer to small two-masted vessels designed to be rowed as well as to sail, rigged with square sails on both masts. The USS Baron DeKalb, a City class ironclad with the Union Navy, is something of a masonic mystery, there being no record of why the civil war vessel would display the masonic square and compasses, although it is know that DeKalb had been a freemason, as was the ship's fifth and final captain, Lt. Commander (later Admiral) John Grimes Walker. Almost as curious is the appearance of the image in the opening credits of the comedy television show, The Big Bang Theory. US National Archives and Records Administration Image, No. 533123. The Freemasons Arms is located on the site of the Freemasons' Tavern, demolished in 1860. Their sign board displays the coat of arms of the United Grand Lodge of England, whose offices and lodge rooms are now situated 250 yards east in Great Queen Street. The Freemasons Restaurant and the Freemasons Tavernoriginally the Freemasons Armshas not only misappropriated the masonic square and compasses for commercial purposes but their web designer, Nick Coquet, has lifted a key element of their website from the collection of masonic images on this website. A sign outside the Square & Compass public house, owned by the same family for a hundred years and noted in all editions of the Good Beer Guide and the CAMRA inventory. The story goes that the name is not derived from Freemasonry, but from the local stonemasons for whom the pub was originally built. The Square is older than it looksbehind the brick casing is a timber-framed building. Through most of the 19th century, the licensee was a blacksmith, John Land Wright, followed by his son, Land. No fancy artwork on the walls, just the brass square and compasses on the mantelpiece. The sign out front was recently reworked. The Square and Compasses is a public house, believed to date from about 1652. At least two horses have been named Freemason. Freemason, an Australian racehorse owned by Jack Ingham, won a Queensland Derby in his three-year-old season, breaking a 10-year-old track record, with the time of 2 min 26 sec at the BMW at Rosehill Gradens on April 12, 2003. Shown here is "Freemason" Favourite hunter of the late Hugo Maxwell Ingham Esq. [plate 3: 6" X 8" image]. The book of the horse, S. Sidney Cassell, Petter, Galpin & Co. London, Paris & New York & Melbourne, 1875 Original chromolithograph. There is also a training stable in Newmarket, owned by Sir Michael Stoute since 1972, called Freemason Lodge. Sir Michael was the only trainer in the 20th century to win a Classic in five successive seasons and has been champion trainer six times. This masonic monument was erected by Solomon's Pillars Lodge No. 59 in the traffic circle on Highway 90 at Izmargad, south of Eilat, Israel on the way to to the Egyptian border at Taba. Masonic Memorial outside the Silvio Pettirossi International Airport in Ascunscion, Paraguay, dedicated on Saturday, 13 October 2012. The monument was built by Pitágoras No. 17 Lodge to commemorate the bicentennial of the independence of Paraguay, and Freemasons such as General Bernardino Caballero (1839-1912)and Marshal José Félix Estigarribia (1888-1940). Relatively uncommon today, in the nineteenth and early twentieth century the local freemasons were often asked to officiate at the cornerstone laying of public buildings. Notable for its rarity, one of the more recently laid is not in fact a cornerstone but is the "capstone" for the Denver Airport in Colorado. A small collection of masonic themed pocket watches. Freemason is a distressed typeface designed in 2003, and posted online without explanation by 21 year old Israeli, Meir Sadan.